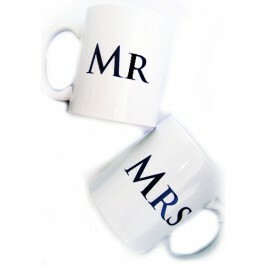 Elegant in its simplicity, this Mr and Mrs Ceramic Coffee Mug Set says it all. No question as to whose is whose with this gift! Each can hold a steaming cup of joe in the morning - does it get any better? It's an inexpensive, yet fun idea for any celebrating couple. 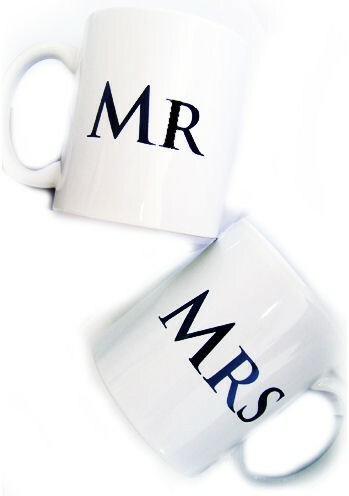 Both mugs are white with tasteful black lettering and hold 11 oz. Don’t forget the coffee! Order our Coffee Favor to complete the set. Mugs are also available in our delightful Wake Up and Smell the Coffee Gift Set.